Old though it is (1976), Basil Greenhill's Archaeology of the Boat is the most useful book I've read in a long time toward understanding boat types and boat evolution. Probably the most important element is a typology for characterizing plank-built boats not by their planking method (i.e., lapstrake versus carvel), but into the categories of skeleton-built vs. shell-built. I'll get into these later, probably in a future post, but here I'll provide some of the background necessary for understanding this duology. 1. Rafts and raft-boats: a craft which is not watertight -- i.e., it does not enclose air. Its buoyancy comes from the buoyancy of the boatbuilding material itself. A "raft-boat" is basically a raft with a more or less boat-like shape, i.e., pointy at the bow, like the Brazilian jangada. Raft building materials include logs lashed together, bundles of reeds, and air bladders like inflated animal skins. Greenhill states that Chinese sampans may have evolved from rafts. The paired illustrations shown below are an intriguing bit of evidence to this effect. 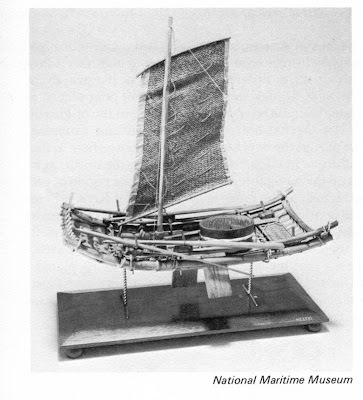 Above: a sophisticated Chinese sailing raft, with movable daggerboards and capable of upwind sailing. Below: the bottom of this sampan shows similarities to the raft above and lends credence to the theory that the sampan is one of the few extant boat types that derived from rafts, rather than dugouts. 3. 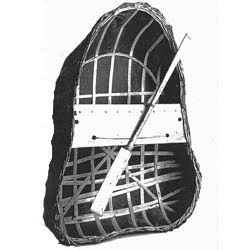 Bark boats: the American birch bark canoe being the obvious example, and the only well-developed one. 4. Dugouts. A hollowed log in its earliest iterations, the dugout was elaborated and expanded upon in many directions, and evolved into most of the boat types we know today. The evolutionary process took place in many phases, at many times and in many places, and it was far from a smooth, linear movement -- which is why we have such a diversity of plank-built boats today. A log that has simply been hollowed out has limited seaworthiness and, as they get larger, they become quite unhandy. Simply but, they're too narrow and too shallow. 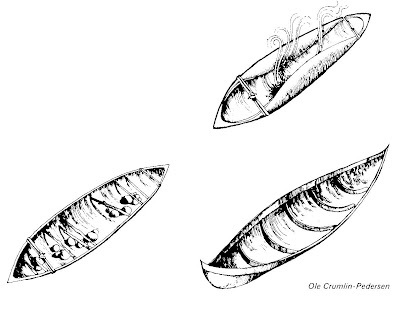 The first stage of evolution, then, was the "expanded" dugout, in which the hollowed log is heated from the inside (top image in the graphic below) , usually with boiling water, and its sides are then forced apart with shores (left bottom). Not only does this increase the beam, but it forces the ends upward, creating a true "boat" shape that is both more aesthetically pleasing and more seaworthy. The process does, however, make the boat even shallower (i.e., reduces freeboard), so the next step is to "extend" the hull by the addition of a single plank on each side (right bottom). Different cultures invented different methods of fastening the plank: pegs, stitches, mortise/tenon joints, dovetail inserts, and so on. Top: dugout heated to soften. Left bottom: expanded. Right bottom: extended by the addition of a strake. This was probably how plank-built boatbuilding got its start in Western culture. But since evolution doesn't progress linearly, it didn't work that way in all cultures and at all times. The Polynesian outrigger canoe, for example, is a dugout that is often extended but not expanded. The large cedar dugouts of the Pacific Northwest were expanded but often not extended. Of course, the Indians of the Pacific Northwest had enormous trees with which to work. 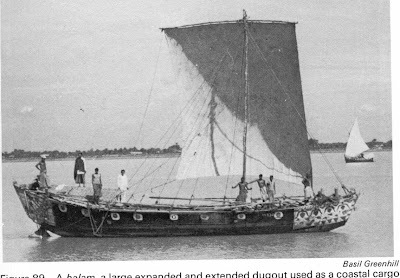 The balam (below), from the Bay of Bengal, is a sewn boat that Greenhill calls the "ulimate development" of the expanded-and-extended dugout. Based on a dugout hull that essentially acts like a backbone keel, it has been extended by the addition of five strakes. Wish I'd known about this place the one time I had the pleasure of visiting the southwestern corner of England: the National Maritime Museum Cornwall. No doubt my British friend and fellow blogger Gavin Atkin would be shocked at my ignorance, but it's news to me and may be to some other readers. A number of boats from non-Western traditions are on display, featured here with nice, but short descriptions, include: canoes of various descriptions (lapstrake, strip-built, paper, dugout, etc. ), kayaks, coracles, a jangada, a Gilbert Islands outrigger canoe, and a dhow. Oddly enough, one of my favorites in the collection is as firmly rooted in the Western boatbuilding tradition as could be: Arthur Ransome's lapstrake dinghy Swallow. Does This Look Like a Spam Blog? I was just notified by Blogger that this blog is a suspected spam blog. I had to submit a request for a human review (apparently, the initial scan is performed by a robot with the intelligence of Glen Beck), and I guess I passed the test, because I seem to be back in business. But just in case I get locked out and they slap manacles on Indigenous Boats, please inform Blogger that this blog is not spam, and that you are a real human reader who doesn't object to its content. Floods, droughts, famines, civil wars, and other disasters carrying widespread poverty and distress in their train have brought begging to a fine art in certain parts of the Yangtze Valley. Normally this is by no means a highly skilled profession, but at Wuhu its followers require to have a knowledge of nautical matters quite out of the ordinary. Here swarms of beggars in tubs cluster round ships made fast to the pontoons and occasionally venture to those at anchor some distance out. This economical and ingenious custom originated as a practice with two old ladies some 30 or more years ago [i.e., around 1937]. Noting that sampanmen were often fortunate in begging from the passengers of ships making a call at the port, and not having the necessary capital to own or even to hire a sampan, they, nothing daunted, took to the water in the one available craft they did possess, a large wash-tub. Instant success attended the introduction of this novel form of craft, a success dependent largely on human nature, for the idle passengers on deck are only too ready to be amused by the vociferous and heated competition between the rival crews as they scramble for coins or morsels of food, with all the attendant risks of colliding or capsizing. As soon as one of the Yangtze passenger-steamers has made fast, several of these elliptical tubs, ranging from 3 to 4 feet across the major axis and sometimes as large as 8 by 6 feet, will appear as from nowhere off the outer side of the ship, varying from the "single seater" variety, paddled with the hands over the side, to one holding a complete family progressing in a style with home-made paddles. The crew in this case usually consists of a woman who, with the inevitable child lashed to her back, acts as navigator and helmsman, and as many children as the craft will accommodate to paddle. There may be a supercargo in the shape of a baby in a cradle. All the children of an age to do so are trained to hold out their hands in whining supplication. Does this sound a bit racist? Perhaps it is, and if so I sincerely apologize if it gives offense. It is, nonetheless, interesting from the point of view of our interest in indigenous boats -- in this case, a relatively modern creation (or adaptation) of a boat type outside the western tradition. 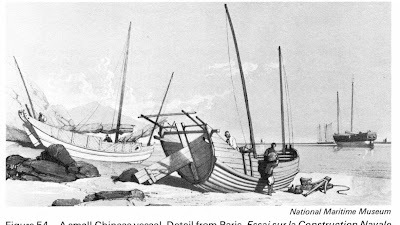 Corrections: Doug Brooks, American builder of Japanese boats, helped correct a few errors of fact or interpretation in my two prior posts on Japanese boats and boatbuilding (this one and this one). Rather than itemize corrections here, I have revised the posts themselves, so if anyone plans to rely on information in either of those posts, please take another look. Of particular interest is that Doug has a new book in the works covering all four of his Japanese apprenticeships. Boat plan from The Tub Boats of Sado Island, by Doug Brooks. Available from the author. Click to enlarge. Doug Brooks, the American expert in traditional Japanese boat construction, gave a lively, fascinating talk a few weeks back at Carpenter's Boat Shop in Pemaquid, Maine, speaking about tub boats and other types, as well as the state of traditional boatbuilding in Japan and the apprenticeship system there. What follows are notes and observations based on his talk, not a coherent treatment of a single subject. Japanese boatbuilders generally use no clamps. They rely on the Spanish windlass and a multitude of props against ceiling, floor, and walls to hold things in place for fastening. Most strakes are edge-nailed to one another. An angled mortise is cut into the outside of the upper plank, near its bottom edge. Special boat nails are used: flat galvanized steel, somewhat curved, with an offset head. These are now hard to obtain, since traditional boatbuilding is virtually dead in Japan. The mortise is then sometimes covered with a small rectangle of sheet copper. Although planks are edge-joined, there is no caulking. Much effort is put into making a perfect wood-to-wood fit by "clamping" (see above) the two mating boards edge-to-edge, then running progressively finer saws between them. This is an exacting and lengthy process, but very effective. Japanese boatbuilders consider any seepage whatsoever that occurs on launching to be shameful, and they view the Western practice of caulking joints with suspicion -- viewing it possibly as evidence of a carpenter's inability to make a watertight joint through a good wood-to-wood fit.. Most building is done in Japanese cedar. Little hardwood is available or used. Planks may be pre-bent over fire (live or charcoal), but not with steam or boiling water. Traditional craftsmen use few drawings and patterns, and those drawings which exist tend to be purposely incomplete, in order to protect "trade secrets." Patterns are usually just small bits of wood that show the proper angle for a particular joint. Everything else is in the builder's head. Students served a very lengthy apprenticeship -- as much as seven years. Even so, the master builder spent almost no time on instruction. The apprentice was expected to humbly absorb knowledge through observation...and through a process known as "stolen knowledge." If the master wouldn't explain a given detail, the apprentice was almost expected to sneak into the shop some night to copy patterns or otherwise figure things out. Although the objective was to duplicate the master's work, even so there was a saying, "The true craftsman must go beyond his master," improving on his methods in some respect. 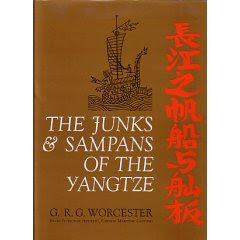 With the exception of Doug's book The Tub Boats of Sado Island, there are no comprehensive books in English on traditional Japanese boat building. Even in Japanese there are very few published works detailing the craft, and most of those that exist are monographs published by local museums, without national distribution. Neither are there any schools of traditional boatbuilding. 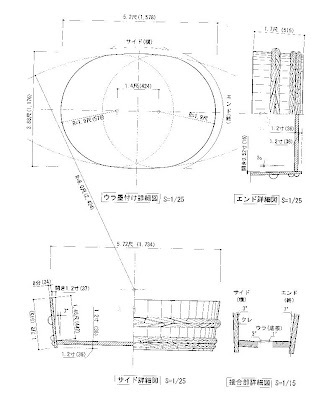 Plans for traditional boats are not available. There are essentially no hobbyist-builders of traditional Japanese types. This is all partly due to the traditional secrecy of the master builders. They hoarded their knowledge, giving it up even to their own apprentices reluctantly. They would never commit designs to paper, fearing theft. Even today, with the last, aged builders passing from the scene, few will reveal their secrets. And given Japan's drive toward modernity following the Second World War, there were few young men interested in pursuing a traditional craft, and even fewer willing to serve the very lengthy apprenticeship required. Doug brought a selection of tools to his talk. Photos follow. Left: a pattern for the inside and outside curves of tub-boat planks and the angles of plank edges. Right: Japanese plane. A Japanese pull-saw, and a miniature example of the braided bamboo hoop for a tub boat. Doug says that braiding the hoops is the most difficult part of building a tub boat. They have to be just the right circumference -- to within a couple eighths of an inch -- in order to fit properly and provide the pressure needed to hold the boat together. Doug is currently working on a book encompassing all four of his apprenticeships in Japan, with funding in the form of a publishing grant from the US-Japan Foundation. This book is due to be published (in English) in 2010 and Doug invites readers to email him their contact information so that he can let them know when the book is available.